All in the Timing: "Queers in Love at the End of the World" & "Where the Goats Are"
I doubt it's solely a modern metric, but there definitely seems to be a trend in contemporary art criticism: the exultation of "getting lost" in artwork. This metric is equally applied to video games, and I know it well. Whether it be my childhood obsessions with The Sims and Age of Empires, or my more recent dives into Dead Cells or Stardew Valley, it's really no challenge for me to log dozens (if not hundreds) of hours in the world of an especially immersive video game. Indeed, all the games I listed have been lauded as "easy to get lost in." It is seen as a positive virtue when you are so enrapt in a game that you forget how long you've been playing it. This relationship doesn't need to be antagonistic. It is much more interesting to think of time as one of the many components a work can use to influence a viewer. 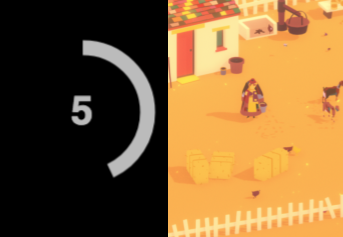 Recently, I played two games that use time as a calculated storytelling mechanic in their game, rather than an antagonist: Queers in Love at the End of the World by anna anthrophy & Where the Goats Are by Memory of God.